a.k.a. "I Can't Believe It's Not Art"
The cruel business world tends to want things as soon as possible. This Pitman phrase is designed to be written "ASAP". It is made from the large circle at the beginning (SS, or more properly SW at the start of words), followed by N, circle-S, P, and finally another S at the end, making "aS SooN aS PoSsible." It is written in a smooth consistently counter-clockwise motion with three quick shakes of the hand.. This somewhat archaic letter closing was one of many standard business letter phrases designed to be quick squiggles made by secretaries taking dictation. It is made up of a VR-hook (in the reversed position), a TR-hook, then an L which smoothly flows into a curve-R with a circle-S at the end, making "VeRy TRuLy youRS." It has a pleasing "cascade" look. More to come. Reader suggestions to add more of the "interesting" outlines are welcome. This is a word not to be taken for granted any more. At the risk of turning this place into a political page, Sept. 11th has shown us that the job of spreading civilization is not yet done. This compact stroke is made up of a tiny embedded S in the large L-hook of a letter V (you actually have to think of drawing the L-hook before the V, unlike the order of the consonants), and closed with an s-shun loop to suggest the sounds sVLsshun. 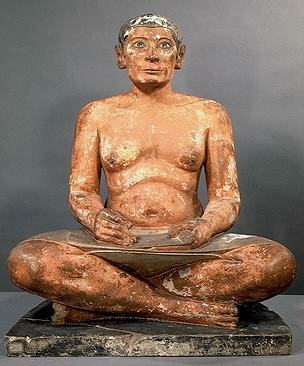 "Seated Egyptian Scribe", 4th or 5th Egyptian dynasty, in the Louvre Museum, Paris. This stenographer had it tough. Although he was a respected court member of princely rank (no mere office-worker), entrusted to take down the sacred words of the Pharaoh on the fly, his materials were not the best, and his language was written in hieroglyphics. His leather kilt would stretch tightly and form a handy triangular desk as he sat cross-legged. But his writing implement was a brush tied to a long thin inkwell tied in turn to an inkstone, capable of maybe only 10 outlines before having to re-dip. Worst of all, hieroglyphics were complex-looking but each produced only one sound or syllable. In practice, he and his colleagues developed a writing system of simplified shapes for the hieroglyphics, called demotic, and combined with an indulgent Pharaoh speaking in a slow, stately voice, he got by, sometimes with a little help from his scribe friends acting in a relay fashion.